| Fresh food & flowers on Olympia's east Side. From our farm to your table. 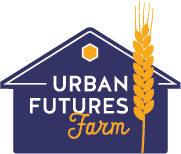 Welcome to Urban Futures Farm website! Here’s where you’ll find all you need to know about good things to eat on Olympia’s east side. We are pleased to offer vegetable and herb starts in the spring (Available NOW – SAT & SUN 9am-2pm) and the freshest fruits, flowers and vegetables each week through our CSA subscription (sold out for 2019). Sign up for our blog or like us on Facebook to receive updates on what we’re harvesting and tips on good eating. Follow us as we grow!